We proudly introduce a new column on Primer, a place to get your real world style questions answered from an expert. If you have concerns regarding your personal style, we've got practical answers to help. We all have them. The annoying questions about our personal style that we just can’t answer. Sartorial woes, no more — get your questions answered about style and substance, what to wear and when to wear it by fellow Primer contributor Grant Harris. When it comes to style advice Grant is a professional — literally. He’s a professional style consultant based in Washington, DC with an eye for long lasting staples versus flashy fashion. But don’t be fooled, Grant’s no dandy, he’s a graduate of the Virginia Military Institute. And his style isn’t dandyish either, so you can be sure your questions will be answered with real world solutions for real world guys, not runway models. Check out Grant's site, Image Granted, to get a taste of what's to come. Submitting couldn’t be easier. 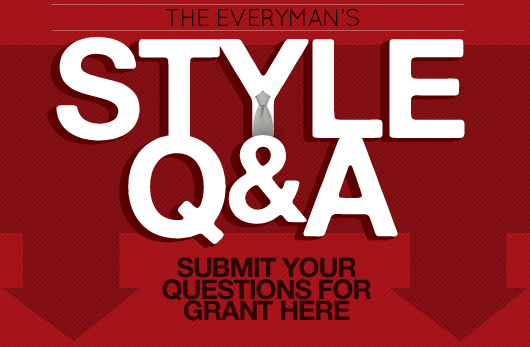 Simply use the form below to enter your style questions and they’ll be submitted directly. We’ll publish the first edition with answers to your questions next week, with a submission form at the bottom of each future Style Q&A. So what’s been bugging you about your wardrobe? No question is too basic or too bougie. Ask away. I’ve known Grant for over 2 years now and I can attest to him being a true style professional. He’s smart, to the point, and passionate about helping men look better so they can achieve their professional and personal life goals. Smart move bringing him aboard Andrew! Thanks Antonio, I look forward to it! Grant’s got a ton of great info to share.